During the 2016 presidential campaign, many presumed that white women voters would cast a ballot for Hillary Clinton. After all, she would be the first ever woman president, a huge milestone for our country. Yet, on Election Day, Donald Trump’s margin of victory included a slim majority of white women voters. To be precise, 53 percent of white women voted for President Trump, marking three decades of white women voting Republican. Even after candidate Trump was caught on video bragging about sexual assault, that did not sway white women to vote Democrat. So, the question left to ask is: Why do white women voters almost always cast a vote for the GOP? According to an article written by Julie Kohler of The Nation, “White women have all too often aligned their political interests with those of white men.” Whether it’s their husbands, fathers, brothers, or grandfathers, the political behavior of white women stems from immediate male associations. In 1848, the movement for women’s rights launched on a national level with the Seneca Falls Convention, organized by Elizabeth Cady Stanton and Lucretia Mott. 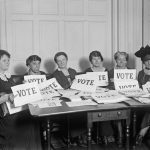 Following the convention, the demand for the right to vote became a centerpiece of the women’s rights movement. After almost a century of activism, the 19th Amendment to the U.S. Constitution was ratified in August of 1920, and American women were finally granted the right to vote. Another factor that weighs into white women’s voting patterns is the systematic influence of religion. Evangelical Christians, for example, are more likely to vote Republican, and white women who are highly active in conservative faith traditions will steer clear of disrupting any cultural norms. In fact, as The Nation points out, support for Clinton was 10+ points higher among unmarried women than married women and roughly 30 points higher among non-evangelicals than evangelical Christians across all educational levels. Identity also plays a roll in the choice white women make in the voting booth. The concept of “intersectionality” has gained popularity in social movements. In layman’s terms, women are not simply just women; they are working-class women, women of color, wealthy women, single mothers, lesbian and bisexual women, transgender women, Christian and Muslim women, and so on. Multiple identities factor into the person for whom who white woman will cast a vote. To give one example, a wealthy white woman who lives in the suburbs is not likely to feel a sense of urgency to stand up against President Trump’s desire to defund Planned Parenthood. She’ll probably never set foot in such a healthcare facility because she can afford to see her doctor for the type of care Planned Parenthood provides, and she may not know any other women who would be harmed by defunding that organization. Another data-focused reason that explains why white women vote Republican is their historical role in white supremacist coalitions in the United States. Sarah Jaffe of New Labor Forum notes that women, in the white supremacist view, were responsible for morally and racially purifying the country. In fact, a woman named Elizabeth Tyler, who was in charge of PR for the Ku Klux Klan in the 1910s and 1920s, participated in the eugenics movement, even managing a “Better Babies” campaign. 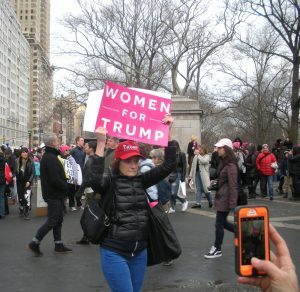 To put it succinctly, white women who voted for Donald Trump on Election Day did so for a number of complicated reasons including “white fear,” lack of association with people who would be hurt by the president’s policies, and a sad history of being heavily involved in the white supremacist movement. If we want to engage more white women in progressive politics, we need to understand what motivated them to vote the way they did and address those concerns.